Panic Button have done some amazing ports for the Nintendo Switch. This time, they have tried their hand at Runic Games Zelda-like adventure, Hob. The game appears to be a perfect match for the Switch, and will hopefully draw in a new audience after its initial launch back in 2017, to which it was rather favourably received. The story of Hob is rather difficult to describe. There is no voice acting, no text, and each of the few conversations that take place are done via some vague sounds and pointing. You begin your adventure with no real idea of what is happening, and it isn’t until the very end that the story truly reveals itself. This can make things hard to understand, with you trying to get to a point on the map with no real idea of why. Because of this, it can be difficult to get invested in the game, though the adventure itself is still a joy. As for the gameplay, it is very reminiscent of the more classic Zelda titles. It has an isometric camera angle, and you solve puzzles to progress through the world. There is an overworld that you can explore, and the more upgrades you unlock, the more areas you can explore. 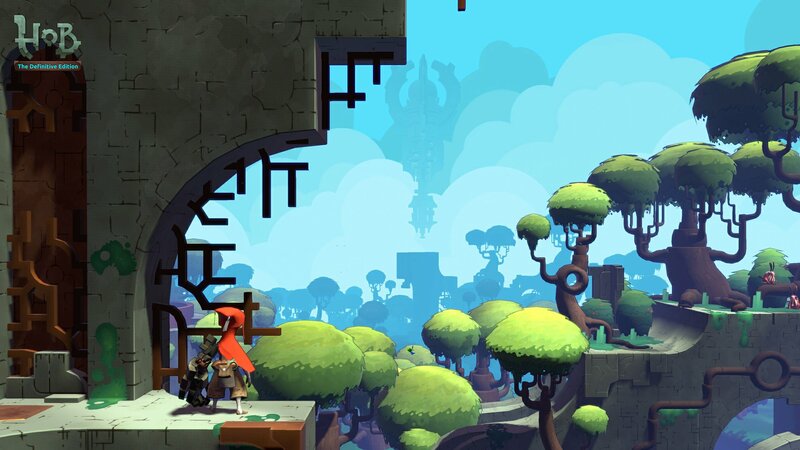 An area where Hob differentiates itself is with the amount of platforming the game has. You will have to time jumps, and do some rather basic platforming along your journey. In the beginning, you have access to some basic attacks for combat. You essentially have just a two-hit combo and a dodge roll. The dodge roll has some invincibility frames to make getting away from attacks much easier, and can help set up some combos for battle. As you progress, you will unlock stronger weapons, more attacks, and better special abilities to help annihilate your enemies. From teleportation to simple attack power upgrades, you will get better and better as you continue on your adventure. These upgrades are administered in a specific building, though thankfully there is a fast-travel point right at the front door to make travelling back for upgrades a breeze. Speaking of upgrades, as you explore the semi-open world, you will find certain flowers and robots to interact with. There are flowers you can cut open that contain hearts. Collecting two of these hearts will increase your health bar, allowing you to take more hits. You will also find destroyed robots, which you can bust open and take their cores. Collecting five of these will net you some extra stamina, which allows you to use more special abilities in a row. I mentioned that the game had a semi-open world earlier. I say semi-open, as the entire map isn’t available to you from the outset. To explore the entire world, you will need to unlock more abilities, somewhat similar to a metroidvania. As such, you can’t call this a truly open world, as it adds a lot of linearity to the entire experience. The platforming sections are a lot of fun, though they are not without their issues. The isometric camera makes things a little difficult at times, as it can be hard to discern distance, and jumps requiring you to tackle at an angle are an effort in frustration. Occasionally the camera can become static and move about like the old Resident Evil games. In these sections, the controls become awkward, due to the camera changes affecting control directions. This would be okay, if it was consistent. Some sections the camera will move, but the movement would work as if the camera was still at the previous angle, meaning your left won’t move to the left of the camera. Towards the end of the game, quest markers stop appearing, and you are left to figure out what you are meant to do on your own. At this stage, the entire map is open to you, so there is a lot to explore, but due to the way the game tells its story, it also means that it is hard to tell what exactly it is you are supposed to do if you aren’t paying attention. In this portion of the game, I found a need to check the map constantly to find my way around to areas I hadn’t explored yet, which made me miss having a mini-map. As for the visual style of Hob, it has a 3D cel-shaded look, with each area of the game having a distinct style of its own. Enemies look menacing and dangerous, especially due to the size comparison to your own character. Unfortunately, some of the textures are quite low quality, and there was a lot of pop-in when the camera would sweep down to reveal things in the distance, as well as during cut-scenes. The sound design is very well done, with a beautiful soundtrack that serves as perfect ambiance, and never gets too self-indulgent to take your attention away from the actual gameplay itself. Monsters have their own distinct noises, and all your attacks sound appropriate for the actions you are taking. The environmental sounds are the real magic of the game though. Each machine you activate, every portion of land you raise, all of the sounds really have rather impactful audio to go along with what is happening on screen. Unfortunately the game isn’t without its technical issues. Hob has some major slowdown issues, with the framerate dipping dramatically in sections. This is usually tied to cut-scenes, but it also happens anytime a camera angle reveals more of the map than you would usually see. The slowdown does happen during some platforming and combat sections, which makes things difficult from a gameplay perspective at times. The slowdown also causes some input lag with your controls, and the sound would desync with what is happening on screen as well. I also got stuck in the environment many times, having to take advantage of the games handy respawn option in the menu. Forcing a death and respawn due to falling through the floor, getting pushed through a wall, or getting wedged between rocks is not an ideal solution, but it does work. It is a bummer that moments like that were so frequent in my playthrough. Hob is a great take on the more classic Zelda formula. It’s interesting world design, fun platforming and exploration, as well as its beautiful audio style all mix together to make an experience worth checking out for fans of the genre. The game isn’t without its issues however, with some technical hiccups that crop up quite frequently. Its vague storytelling can be a detriment at times as well, as the game doesn’t always do a good job of letting you know what you need to do next, nor do you know why you are doing any of this until the end of the game. Overall though, these issues are not enough to completely ruin what is an otherwise excellent adventure.